NEWS UPDATE: Bidding on Jenny’s painting is now closed. 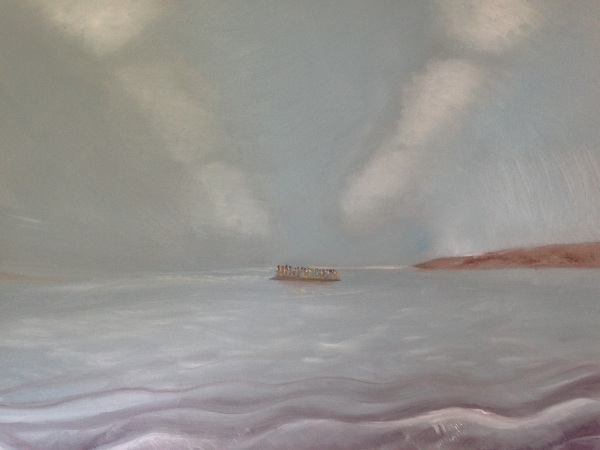 Bidding on Anthony’s painting, Arrival at Lesvos, has been extended until 1 July 2018. The artists will each put a painting up for sale through a bid (starting at £330) – giving 100 per cent of the proceeds to the local good causes. Bids will be taken by the artists Jenny and Anthony at the opening view on February 15th. A written record will be made in a bid book and a copy given to the bidder. Bids can also be made by email to [email protected] and will be acknowledged and also recorded in the book, up to closing date of 30th March at 5pm. The winning bid will be announced on April 1st. Anthony said: “Duley’s work appeals to my sense of justice, which is why I entered the legal profession. The exhibition will run for six months – closing on Friday, July 13 – and will be open daily 9am to 5:15pm.